IT is a holiday-shortened trading week in Kuala Lumpur, with Thaipusam on Wednesday and Federal Territory Day on Thursday. 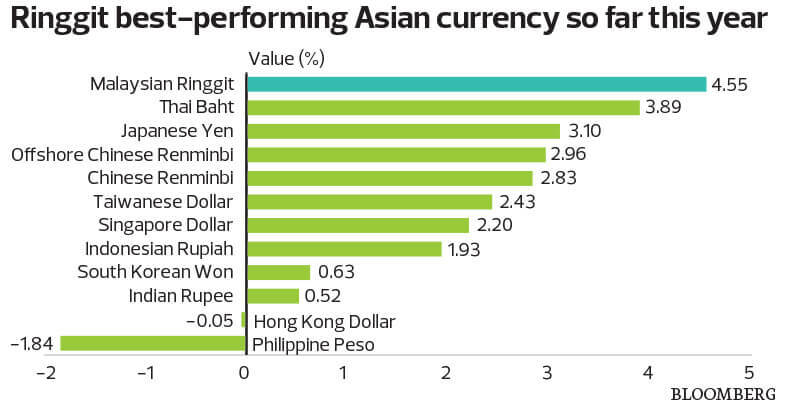 The spotlight is on the ringgit, which is Asia’s best performing currency so far this year. It is at its highest level in nearly 2½ years — which would boost the feel-good factor ahead of the general election that could happen anytime soon. In fact, Minister in the Prime Minister’s Department Datuk Abdul Rahman Dahlan told attendees of the Standard Chartered Global Research Briefing 2018 on Jan 25 that it has been “far too long” a wait for the 14th general election and preparations have been going on “for 1½ years now”. At the time of writing, the ringgit fetched 3.87 to the US dollar, its highest since August 2015, even as the greenback floundered. The ringgit has gained against the Singapore dollar at 2.9655, a level last seen in July 2016. Bloomberg data show the most bullish projections for the US dollar at 3.68 to 3.78 for this year, compared with median projections of 3.94 to 4.03. Forward rates ranged from 3.88 to 3.91 at press time. On the macro front, with Bank Negara Malaysia getting its anticipated 25 basis point increase to 3.25% out of the way last Thursday, attention turns to the US Federal Reserve’s Federal Open Market Committee’s first rate decision of the year. In December, the FOMC maintained its guidance for three more hikes this year. The Fed’s decision — which is slated to be out in the early morning of Feb 1 here — will be outgoing Fed chair Janet Yellen’s last rate announcement. Jerome Powell, who was confirmed by the Senate on Jan 23 as the 16th Fed chairman from Feb 3, has served on the central bank’s board since 2012 and had emphasised during his confirmation hearing that he was not planning to push for sharp changes in monetary or regulatory policy. Powell, who is well-versed in finance and public policy, will be the first Fed chairman since the late 1970s without a degree in economics. Malaysia is slated to release the Producer Price Index for December 2017 on Tuesday. Other data releases on the same day include the latest reading for the eurozone’s gross domestic product, the Industrial Sentiment Index and the Consumer Sentiment Index. The US Consumer Confidence Index is also slated for release on Jan 30, the same day the Bank of Japan is releasing a summary of opinions from its board members at its recent Jan 22 and 23 policy meeting. Japan is also slated to release its industrial production data. On Wednesday, data releases include Australia’s Consumer Price Index (CPI), the eurozone’s indicator of inflation or the Harmonised Index of Consumer Prices (HICP), the US ADP employment survey and Canada’s GDP. Kicking off data releases on the first day of February are South Korea’s exports and trade balance, the CPI for Indonesia and Thailand, Manufacturing Purchasing Managers Index (PMI) for India and the eurozone as well as the US ISM Manufacturing Index. On Feb 2, Singapore is releasing its Manufacturing PMI while key data releases in the US include the latest unemployment and payroll data along with the University of Michigan Sentiment Index. On the corporate front, TMC Life Sciences Bhd’s annual general meeting (AGM) is on Monday while Chin Teck Plantations Bhd, PLB Engineering Bhd, WZ Satu Bhd and D’Nonce Technology Bhd are holding their respective AGMs on Tuesday. Companies holding extraordinary general meetings (EGMs) on Monday include Malaysia Steel Works (KL) Bhd (Masteel), Ideal Jacobs (Malaysia) Corp Bhd and Denko Industrial Corp Bhd. Masteel is seeking shareholders’ approval for a proposed one-for-three bonus issue. Ideal Jacobs is seeking approval for the purchase of Widad Builders for RM520 million in cash and shares; the disposal of its several overseas units for RM28 million; a proposed placement of up to 25% of its enlarged share capital post its proposed acquisition; and to give one free warrant for every five shares held after the acquisition, disposal and placement. Denko, meanwhile, is seeking approval to pay RM1.18 billion to acquire Integrated Manufacturing Solutions Sdn Bhd (IMS) from Denko’s chairman and major shareholder Datuk Seri Foo Chee Juan and Datuk Fong Chiu Wan. Denko and IMS make plastic injection moulds and serve customers in the electrical and electronics industry. The independent advisers say the proposed acquisition is “fair and reasonable” and recommended that non-interested shareholders vote in favour of it. On Friday, HB Global Ltd, which is still in the process of formulating a regularisation plan to address its Practice Note 17 status, proposes to appoint Messrs UHY Lee Seng Chan & Co as its external auditors in place of Messrs RT LLP at its EGM in Johor.